Melt 1/4 cup butter in a large skillet over medium until melted and foamy. Add fish to skillet, and season with salt and pepper. Increase heat to medium-high, and cook fish until flesh is opaque and flaky and outside is browned, 4 to 5 minutes per side. Transfer fish to a plate; keep warm. Melt 2 tablespoons butter in skillet, and add mushrooms, shallot, and parsley. Sauté until mushrooms are browned, about 5 minutes. Add wine, bring to a boil, and cook until liquid is reduced by half. Add remaining 2 tablespoons butter, and stir to combine until butter is melted. Reduce heat to low, and stir in heavy cream and sour cream. Simmer gently until thickened, about 1 minute. 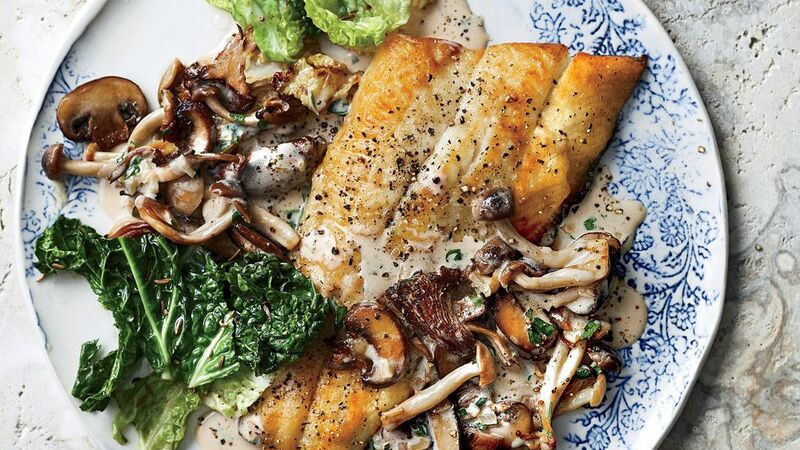 Divide fish and mushroom mixture among 4 plates, and garnish with chives.